Birkirkara are heading into their home clash with Scottish club Hearts of Midlothian in good heart. Their confident performances in both legs of the Europa League first qualifying round match against Bosnian team NK Siroki Brijeg have indeed strengthened Birkirkara’s belief that progress to the next stage is not beyond their reach despite their status as underdogs. Drazen Besek, the Croatian coach who slowly but surely is stamping his mark on this Birkirkara side, is upbeat about his team’s prospects of extending their positive run in the Europa League when the Stripes host the renowned Scottish Premiership club in the first leg of their second qualifying round game this evening at the Hibernians Stadium (kick-off 8.30pm). 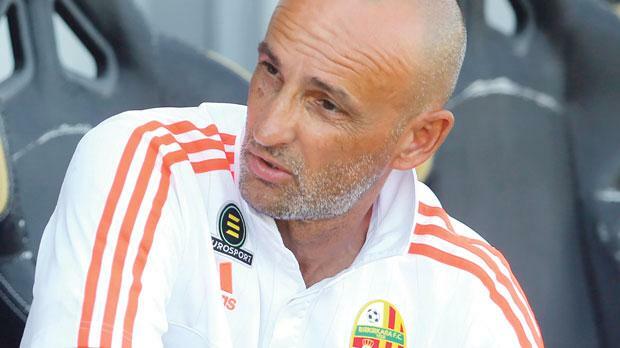 “Birkirkara are growing from game to game,” Besek, who succeeded Giovanni Tedesco last December, told Times of Malta. The Stripes sealed their passage to the second qualifying round in emphatic fashion last week as they beat NK Siroki Brijeg 2-0 at the Corradino ground after a 1-1 draw in the away leg. Envisaging an aggressive ap-proach from Hearts, Besek believes that Birkirkara must use their possession effectively to cope with their opponents’ pressure. “All Scottish teams are renowned for their aggressiveness,” Besek said of Hearts, who encountered little trouble to book their place in the second qualifying round after a 6-3 aggregate victory over FC Infonet Tallinn, of Estonia. “These type of teams can punish every mistake, so it’s very important that we keep the ball well and use possession effectively. “It will be interesting to see how my players respond to the aggressive approach of Hearts. Besek has no intention of adopting a defensive strategy. “We’re playing at home and we can’t defend,” the Croatian said. At this time last year, Birkirkara were buzzing with excitement as they limbered up for their big clashes with West Ham United. It turned out to be a memorable experience as the Stripes came agonisingly close to pulling off what would have been a shock of seismic proportions, losing on penalties in front of a full crowd at the National Stadium after Fabrizio Miccoli’s early goal cancelled out the 1-0 deficit from the first leg. Memories of the West Ham games ought to further inspire the Birkirkara players who figured in those ties but, as Besek pointed out, there have been many changes in the squad. “This team has experience from last season, which is important, but we have also changed many players since then,” Besek said. “The way I see it, we have a 50-50 chance before this game. Besek is expected to include the club’s latest signings, Croatian midfielder Bruno Marotti and Serbian striker Dejan Djordjevic, in his squad for tonight’s game. Djordjevic, 23, completed his move on Monday after signing a one-year contract. He last played for Sloboda Uzice in the second division of Serbian football. Defender Predrag Jovic has not recovered from injury while Emerson Marcelina is doubtful as he was down with fever in midweek. Striker Frank Temile has started training after his return from Nigeria was delayed by complications surrounding his visa. However, he will not be available today. Meanwhile, Hearts coach Robbie Neilson said he’s treating Birkirkara with respect. Speaking after Hearts set up a meeting with the Stripes last week, Neilson said he anticipated another tough game against a valid side, noting also that the stifling heat in Malta will pose an added problem for his team. “They played West Ham last year and had good results against them so we know it’s going to be a hard game,” Neilson told HeartsTV. “We also have to deal with the heat out there. Today’s referee: Ivaylo Stoyanov (Bulgaria FA).